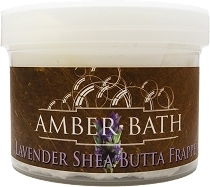 70% shea butter, 30% sweet almond oil are the ingredients in this product. Yes, you read right, there are only two main ingredients in this innovative, creamy, whipped, in-shower moisturizer. Since we use no water in our products (water is used to stretch product), a small dollop of our frappe will change the way you hydrate your skin. We use this product while water droplets are still on our skin in the shower under the warm stream of the water. No, It won”t go all over the shower floor like a body oil. It stays where you put it! On your hot bod! Then, dab dry with your towel and your skin will have a gorgeous sheen, and be the most nourished on the block. Pink grapefruit essential oil is tangy, uplifting, and summery. The smell is wonderful, it's a lite grapefruit scent. I will be purchasing this one again!